Pushing the debate ahead to where it will affect more workers is where the debate needs to go. What, you won’t give us $10.10? OK, we’ll take $12. At a time when progressive positions are compromised before they are given a chance to help the economy, boost family prosperity and lessen growing inequities, minimum-wage proponents have drawn the line at an unusual place in the sand: ahead of the one before. It’s a bold stroke when the House and Senate leaders are against any increase in the current minimum of $7.25 an hour. The national minimum wage has been stuck there since July 2009 — and in Iowa even longer, since the state minimum rose and stopped there in January 2008. Seven-plus years later, inflation has put minimum-wage workers in Iowa behind where they were in 2007 and 2008. In 2013, Senator Tom Harkin of Iowa and Congressman George Miller of California teamed up to promote $10.10, calling $7.25 “unconscionably low.” But it has not happened. Last week, Senator Patty Murray of Washington and Congressman Bobby Scott of Virginia introduced legislation to raise the minimum to $12 by 2020, in five steps. It also would eliminate the $2.13 tipped wage and index the new minimum to inflation. 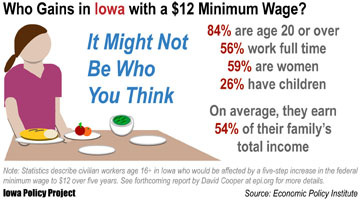 Here’s an Iowa fact sheet, and here are reports from the Economic Policy Institute and National Employment Law Project. For some a $12 minimum wage will still sound too low. For some it will sound too high — which is why the debate retreated to $8.75 in Iowa this year, and that cannot even get a vote in the Iowa House. Pushing the debate ahead to a place where it will affect more workers — 436,000 in Iowa, or 42 percent more than the 306,000 affected with a minimum at $10.10 — is where this needs to go. It may increase pressure to the point where we see more candidates taking a stand and votes taken in Washington and more state capitols. The Iowa Policy Project is a nonprofit, nonpartisan organization. IPP is a 501(c)3 organization and contributions to IPP are tax-deductible as permitted by law.